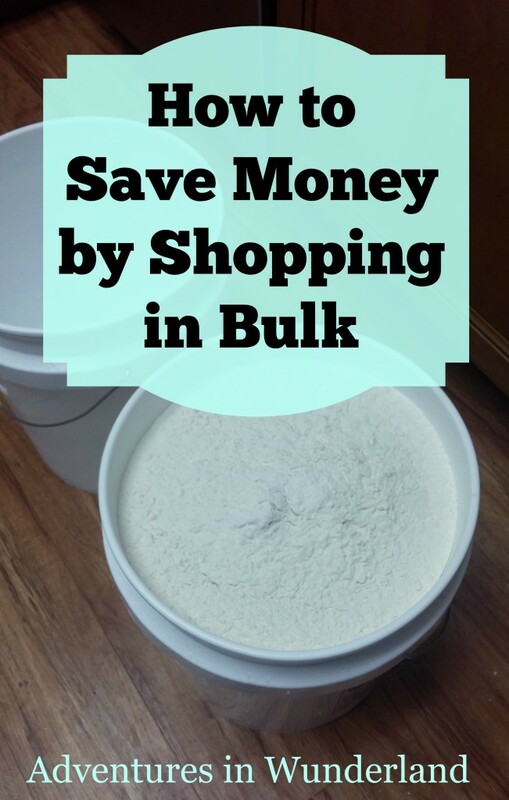 It’s no secret that shopping in bulk can save you A LOT of money but many people don’t know how to save money with bulk shopping. Some items, when bought in bulk, are a serious bargain – others, can be a huge WASTE of money. So, how do you know if it’s a bargain or a waste? Easy, I’m going to tell you exactly which items to purchase to save money by shopping in bulk. 1. Paper Products: Paper products can be purchased in large quantities and the more you buy at once, the cheaper they usually are. As long as you have the space to store them, buy away as paper products aren’t ever going to go bad. 2. Baking Products: Flour and Sugar are ridiculously cheap when you buy them in large quantities. You can buy 5 lbs. for $5 or 25lbs. for $10-$15- you do the math! The same goes for flour. The only problem you might run into is storage. We keep ours in these Food Grade Plastic Buckets with airtight lids. 3. Dried Foods: Dried Beans, Oats and Rice. Just like the sugar and flour, last an incredibly long time and can save you a ton of money when bought in bulk. Store them in the same food grade buckets as the flour and sugar. 4. Meat: Typically the larger the pack of meat the less expensive it is going to be. I purchase the largest pack possible and then separate it out into individual freezer bags and immediately freeze it. 5. Fruits & Vegetables: Many fruits and vegetables do not have a very long shelf life but if you immediately freeze them they will last for months! When you find your favorites on sale buy them up and freeze right away. Do pay attention to the type of fruit or vegetable though, some do not freeze well and others do. For example oranges and lettuce will not freeze well but berries, carrots, and green beans freeze great! I buy berries when they go on sale and also large bags of carrots and freeze to use in recipes at a later time. Wash them well before freezing using this all natural vegetable wash.
And there you have it. The secrets to saving money by shopping in bulk! I have cut our grocery bill nearly in half buy shopping in bulk and I hope these tips help you out as well. Do you have any other items you have found at a great price when purchased in bulk? I’d love to know! Looking for more organizational tips? Be sure to check out Everything You Need to Get Organized in 2015. And once you’re organized you’ll want to keep it all clean – print out our FREE Cleaning Schedule to help you keep up with your home!